Three sensational voices that will make your emotions soar to the STARS: from opera to pop and jazz … each note will overwhelm, provoke and fascinate you!!! 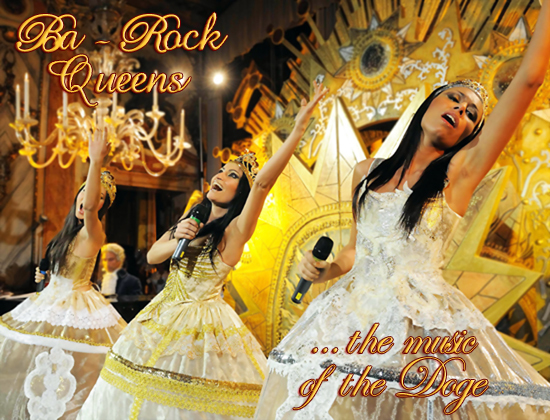 With their spectacular and sparkling theatrical costumes – created and made exclusively for the three sopranos by Antonia Sautter – matching each of their performances, these divas will lead you through the magic of the Carnival, experienced, experimented and translated into reality just for you! Meet the Characters of the Commedia dell’Arte, let your self be enthralled by this magical world, close your eyes and cross through the doorway of the Dream. It’s you, it’s here … Venice and its Carnival are waiting for you!!! To arrange a costume fitting, please call the office during the week or the boutique during the weekend. Do you need more info about the event? Contact the event organizer: Antonia Sautter Creations & Events.